At the heart of this new strategy: job cuts and restructuring. 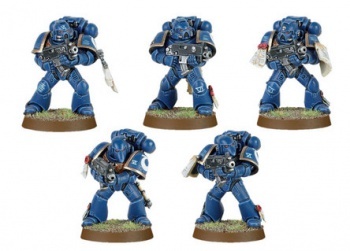 Games Workshop has had a really good year, says acting CEO Tom Kirby. Not that great if you're measuring by that pesky profit margin, or even stock price for that matter; sales fell by 9% in the year, thanks in part to hard times in the North American segment, and profit before taxation fell to Â£12.396 million, as opposed to last year's Â£21.395 million. However that isn't what Kirby's pleased about. What has him smiling is that Games Workshop has streamlined distribution, implemented its one man store policy, and cut huge chunks out of its middle management structure. Cutting costs and reducing risks, says Kirby, is key to Games Workshop's long term survival. "What is really remarkable, however, is that it was all accomplished in five months. The levels of complexity handled by our back office staff - personnel, IT and accounts -are beyond my descriptive abilities," says Kirby. "We all owe these people a big vote of thanks. They have saved the company millions." Games Workshop reinvented itself in the fiscal year now ended. It used to be organized on a country-based management system; now all those middle managers have been let go, four European offices have been shuttered, its North American arm no longer has autonomy, and pretty much everything is run out of Nottingham. Its one man store policy means exactly that: each store has one member of staff, which saves on salary but theoretically means each store manager should be earning more than before. Kirby touched briefly on copyright concerns, without actually mentioning the dreaded words Space Marine, let alone Chapterhouse Studios. He describes Games Workshop's legal crusade as "very difficult to do ... far too much money spent on far too little gain," a remarkable statement given the company's litigious history. One of the big reasons why Games Workshop has been ferocious about its IP is its arrangements with third party computer game developers, like the now-defunct THQ. Back in 2009, royalty payments on that IP made up nearly half the company's profits. Things have changed significantly since then; in fiscal year 2013 royalty payments dropped Â£3.5 million, going down to only Â£1 million, and while there was some improvement in fiscal year 2014, it was only up Â£0.4 million. Perhaps, with less royalty cash on the line, Games Workshop can afford to be philosophical about its IP. However you'd be unwise to publish, say, Adventures of a Space Marine Love God any time soon, entertaining though the idea may be. Games Workshop might be a little philosophical, but there's no reason to think it's forgotten its lawyers' phone number. Kirby also announced his intention to step down as acting CEO. An ad for his replacement will go up the day after Games Workshop's AGM, on September 18th. "We have not decided what will happen if no suitable candidate is found," says Kirby, "But I suspect my wife will be livid."